Influenced by Jung (1954), Martha's sand tray therapy theory addresses authenticity, focuses on the inner self (soul), and targets women in specific. 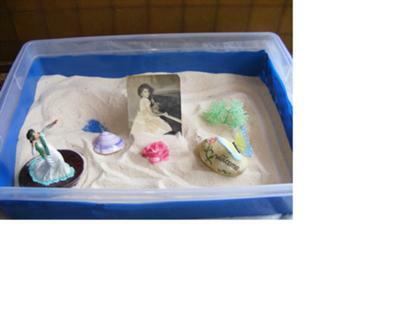 My sand tray therapy theory and the lesson plans may also be extended to men and adolescents of both genders. Stephen Armstrong (2009) spoke on his videos about a disconnection between people’s feelings and their bodies based on the notion that many people do not want to know the truth and they invest much energy in keeping themselves from the truth about themselves. 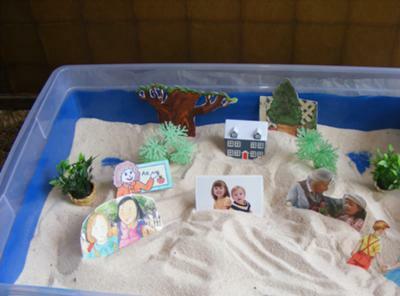 With that in mind Martha’s sand tray therapy theory aims to address the need to embrace reality and search for authenticity in the sand tray. I would apply my theory to my population (women) with the help of the three symbols of the Hawaiian culture: the Lei, the Holoku and the Luau. The Lei represents spirituality (spirit of Aloha), the Holoku represents respect for history (our family history), and the Luau represents abundance (blessings). •	When the client is finished creating the scene, ask the client: What would you like to say to this little girl in the photo or what do you think she may want to tell you? Applying Lesson Plan # 1 to myself: Photo # 1 shows a miniature of a female Hawaiian wearing a Holoku—a formal dress worn by Hawaiian women dating back to the early 19th century when Hawaii was ruled by a monarchy. Respect for history is an integral part of Hawaii. Respect for history is equally observed in many families. I have placed a photo of myself from the time I was eight years old. I have also placed other miniatures in the sand to represent other women in my family who have impacted my life one way or another: my mother is represented by a rose because her middle name was Rose. Both of my grandmothers are represented by a rock that reads “Welcome” because that is the way I always felt when I was in their company. One of my aunts is represented by a tree because she is still living, and my other aunt is represented by a shell symbolizing her love for the beach. This lesson plan may be particularly important for Hawaiian women because the Hawaiian culture is significantly influenced by old traditions and the foundation of continuity. Applying Lesson Plan # 2. Photo # 2 shows a Lei symbolizing the Spirit of Aloha. 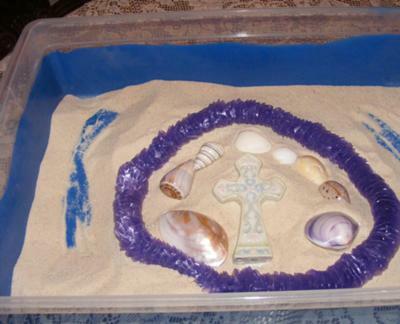 A cross in my tray symbolizes my Christian beliefs and spirituality. The shells surrounding the cross symbolize my love for peaceful meditation. This lesson may be very meaningful for Hawaiian women because of what the Lei represents—these are garlands made of flowers, nuts or shells that trace back centuries earlier when the first settlers came to Hawaii. It symbolizes harmony and agreement. This lesson may be very important to Hawaiian women who have grown up organizing and attending luaus with family and friends. A luau is a feast to the senses and an opportunity to become aware of one’s blessings. Armstrong, S. (2009). 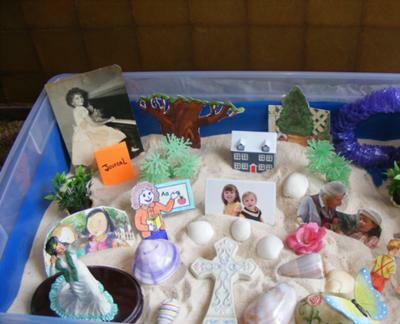 Sandtray therapy: A humanistic approach. Dallas, TX: Lucid Press. vol. 9 (part I). Princeton, NJ: Princeton University Press.